The signing of the Global Compact for Migration was greeted with many comments. Damien Rieu, an activist with the Génération Identitaire movement, “estimates” that France already spends 4.5 billion euros on immigration. He’s basing his figures on Nadine Morano statement. According to him, the French state already spends 4.5 billion euros on immigration, including “1.5 billion euros on integration, 2 billion on unaccompanied minors, and 1 billion on state medical assistance to migrants.” The YouTube video has over 53,000 views. While these figures are accurate, they are not enough to draw up a balance sheet for immigration. Immigrants? Foreigners? Who are we talking about? The United Nations defines an immigrant as a foreign person, born abroad and residing for a year or more in a given country. In the immigrant category, then, we can include Erasmus students who stay longer than a year. The term “foreigner” refers to an individual residing in France who does not have French citizenship. Not all foreigners are necessarily immigrants (e.g. tourists), nor are all immigrants necessarily foreign (e.g. naturalized French). INSEE (the National Institute of Statistics and Economic Studies) puts the immigrant population in France at 6.2 million in 2015, or 9.3% of the total population. 2.4 million immigrants, or 39% of this group, have acquired French citizenship. 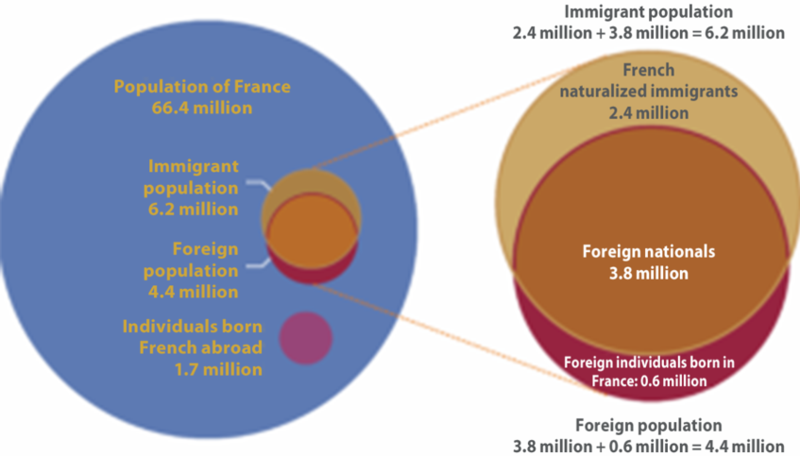 The foreign population living in France is 4.4 million, or 6.7% of the total population. So, are these immigration numbers true or false? State medical assistance (AME), meanwhile, was estimated at upwards of 923 million euros in 2018. Created in 2001, AME is a framework allowing foreigners without legal status to access care, provided that they have resided in France for over 3 months. François-Noël Buffet, the Republican senator from the Rhône, estimates that more than 310,000 people currently receive this benefit. Furthermore, the Senate voted in early December to lower the budget for AME by 300 million in 2019. The health minister Agnès Buzyn expressed her disagreement with this decision. But this decrease could soon be invalidated by the National Assembly. On the second point raised by Damien Rieu, the Assemblée des départements de France (Assembly of French Departments) estimates that French departments accommodated 40,000 unaccompanied minors of immigrant background in 2018. If we factor in the cost of caring for a foreign minor through child welfare, estimated at 50,000 euros per year on average, this totals 2 billion euros. But this level of spending for each unaccompanied minor is “unlikely,” says Catherine Wihtol de Wenden, a politician and researcher specializing in migration issues. Like Dumont, several other economists call for the costs to be weighed alongside the contributions. Catherine Wihtol de Wenden asserts that “immigration yields more than it costs.” As proof, she cites German growth in 2017, boosted by the welcoming of a million refugees in the previous year. A 2010 report from DREES (a department of the French Ministry of Health) led by the economist Hillel Rapoport estimates the net contribution of immigrants to public finances in 2005 at 4 billion euros. In short : Some of the figures given by Damien Rieu seem to be corrects. But the way he uses them are questionnable. We, students, had lots of debate about this fact check. 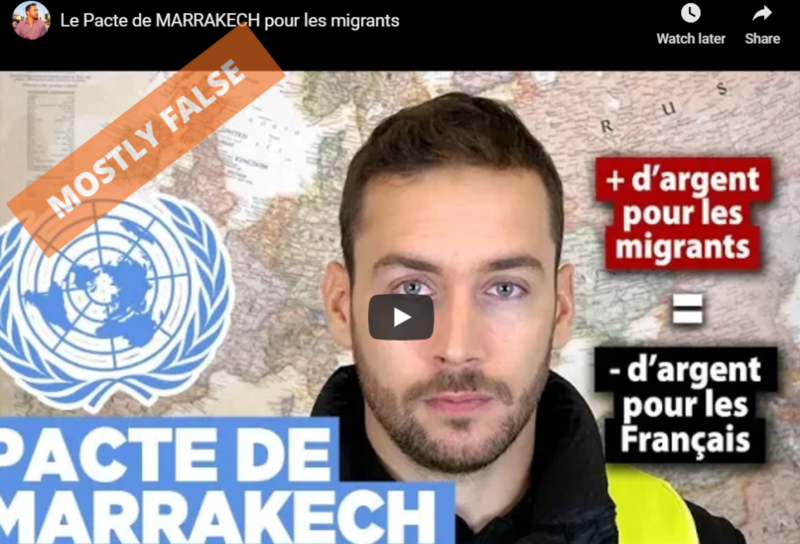 But as, the video had around 60k views and as the claims is based on Nadine Morano figures (and the politician confirmed it to us on the phone), we decided to fact check it… and find those assertions, without background are mostly false.